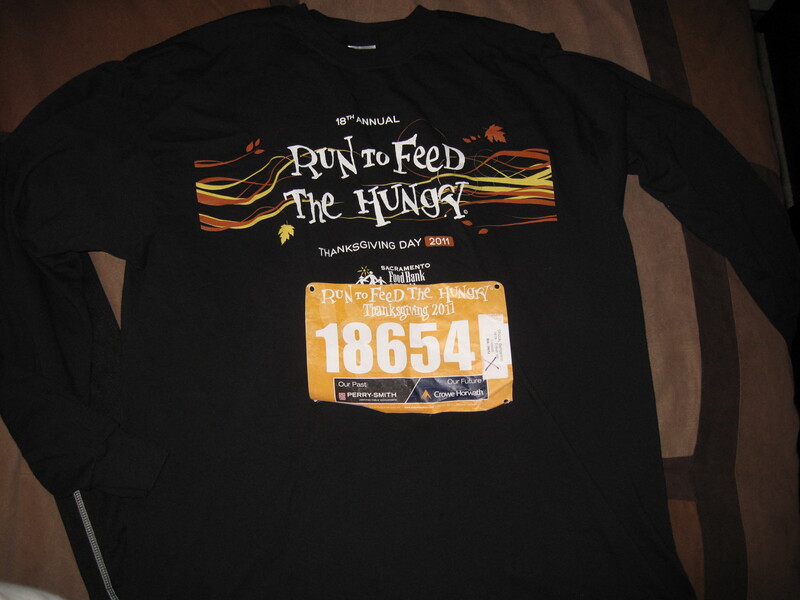 The last race I did for 2012 was the Run to Feed the Hungry 5K on Thanksgiving. I did it last year with Ben and this year, the boys wanted to do it too. 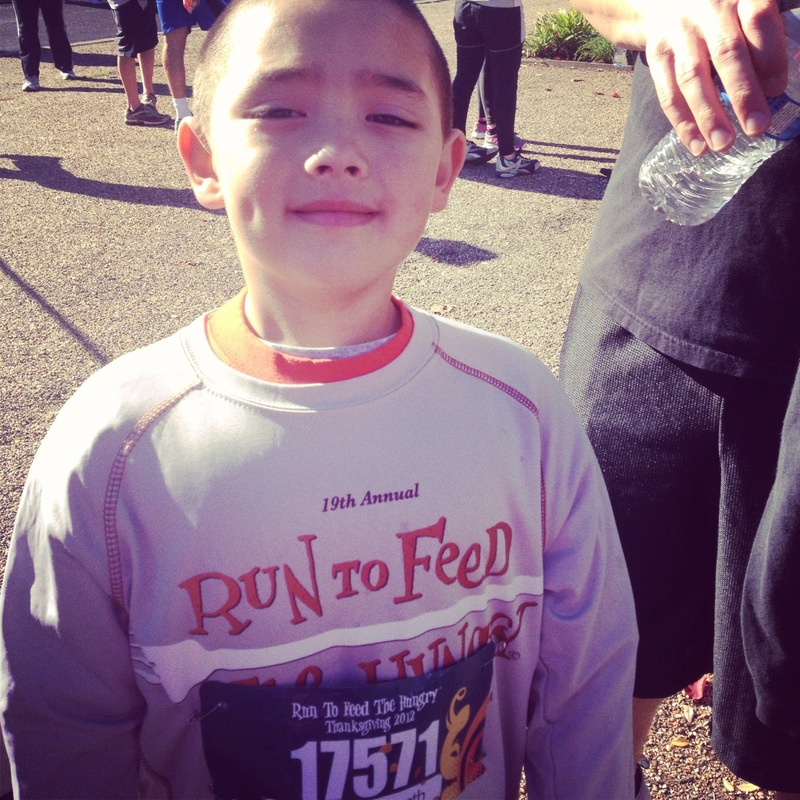 I was hesitant to sign them up for it because I didn’t think that they could make it the whole 3.1 miles – especially Seppe. Ben wasn’t going to do it because he hadn’t trained for it like he did last year but said that he would walk with the boys. So I signed us all up :-) Ben’s dad even joined us on race day. I did not train too much for the race. I stuck to my regular routine for the most part. I ran 3-4 times a week with one long run. My main goal was to beat last year’s time. I wasn’t confident that I would because my practice runs weren’t showing much improvement from last year at all. Being away from home made it a challenge to prep. I got up and got dressed while Ben and the boys were still asleep. My breakfast was a Luna bar and a banana. Once I was ready, I got the boys up and got them ready. Ben was the last one up, but we still made it to the race an hour before it started. 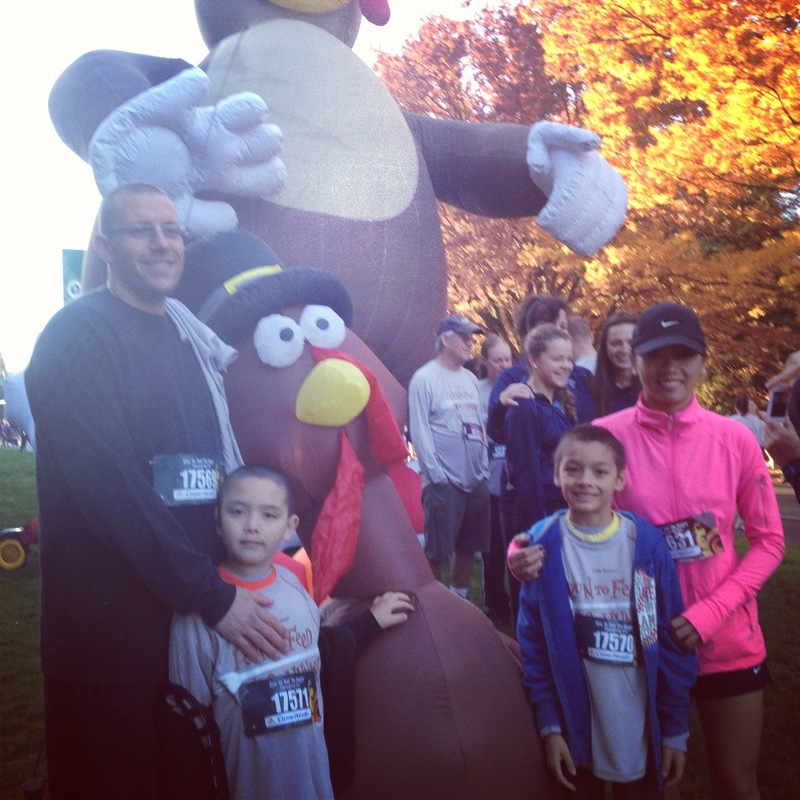 After picking up our race bibs, we took a family photo in front of the turkeys. 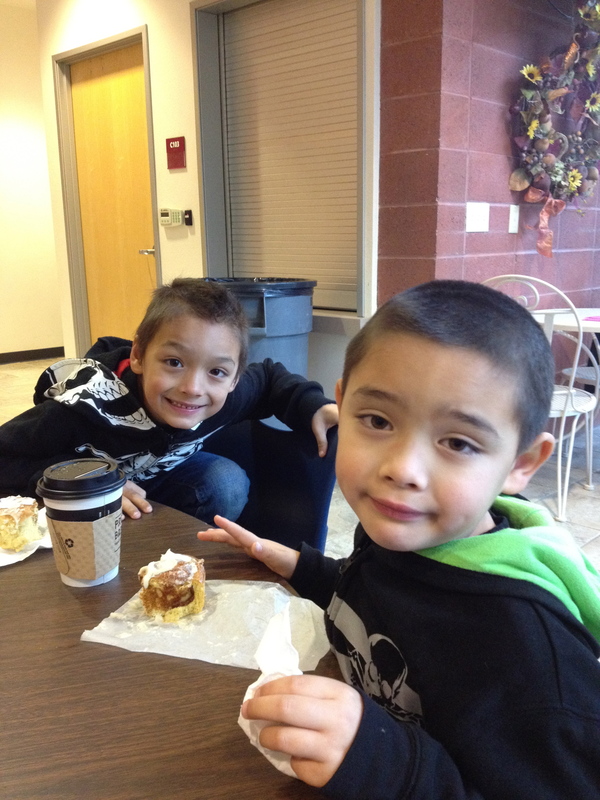 Then we went over to the campus cafe that we found last year to stay warm while we waited for the race to start. 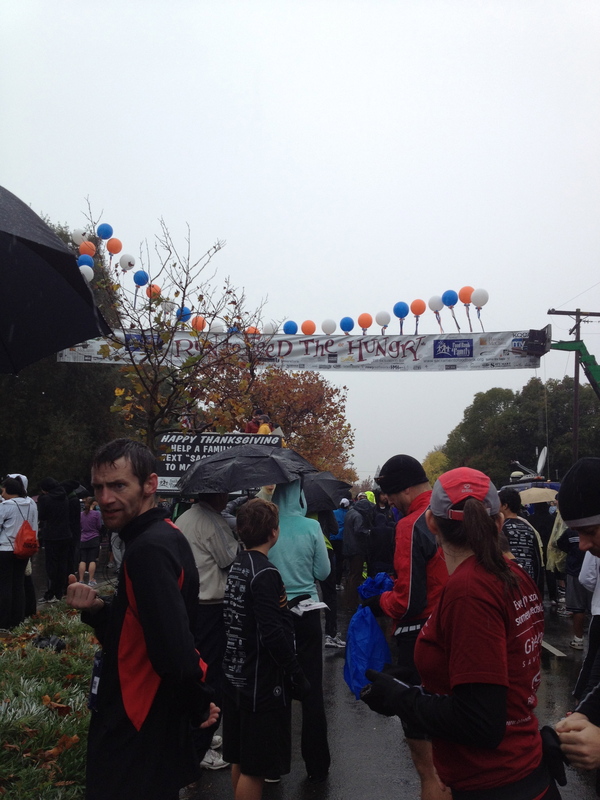 The Finish Line – so many people! Over 27,000! Gio giving Seppe a hug after he finished the race. Seppe trying to be happy. 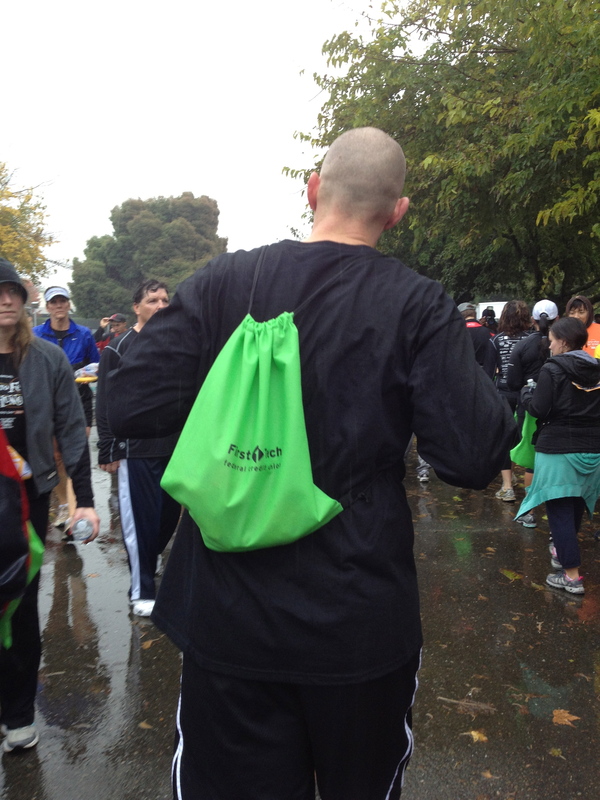 This year they didn’t have bags for us so we had to carry all the post race goodies in our hands. The boys were pretty worn out so we headed back home. We showered and got ready to celebrate Thanksgiving with my family. I was really glad that we did the race as a family. I am very proud of my boys. 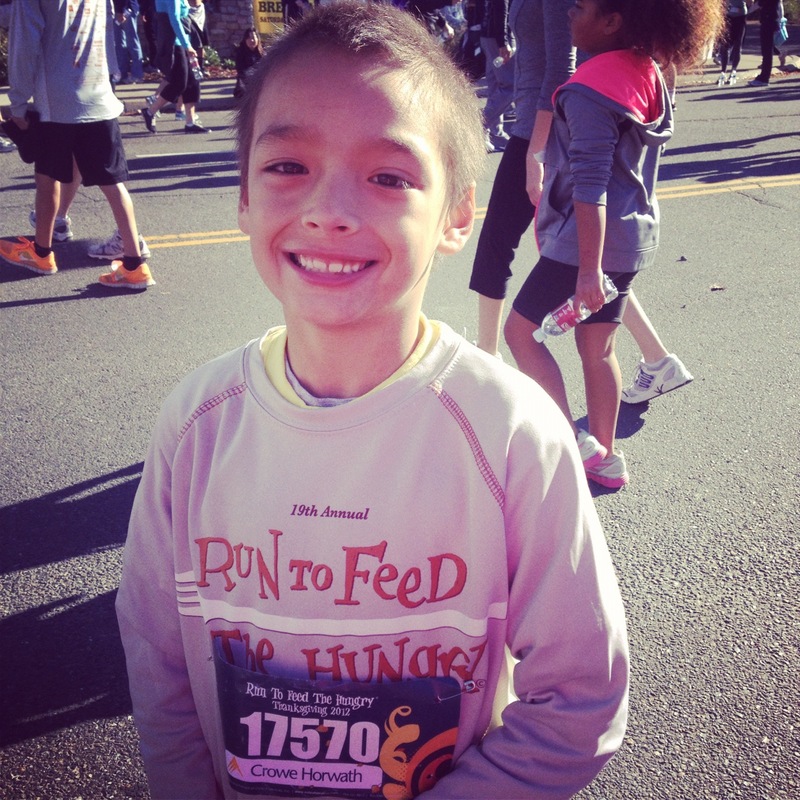 I think that with a little training, Gio could do another 5k. For Seppe, I will have to keep him to the shorter distances so that he doesn’t get too discouraged. Gio and I will be doing this race again next year :-) I know it won’t be too much longer before he will be passing me up. 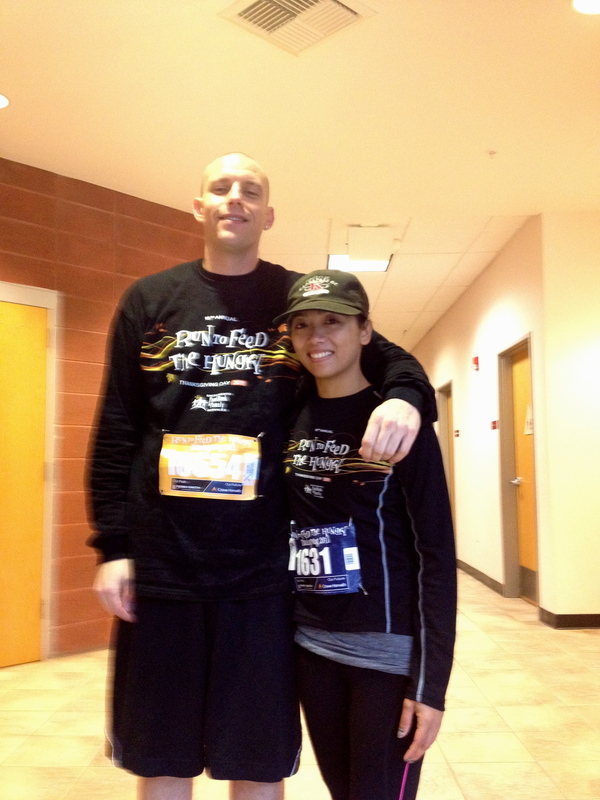 Like so many of my fellow TIU team members, I did a 5K race on Thanksgiving. 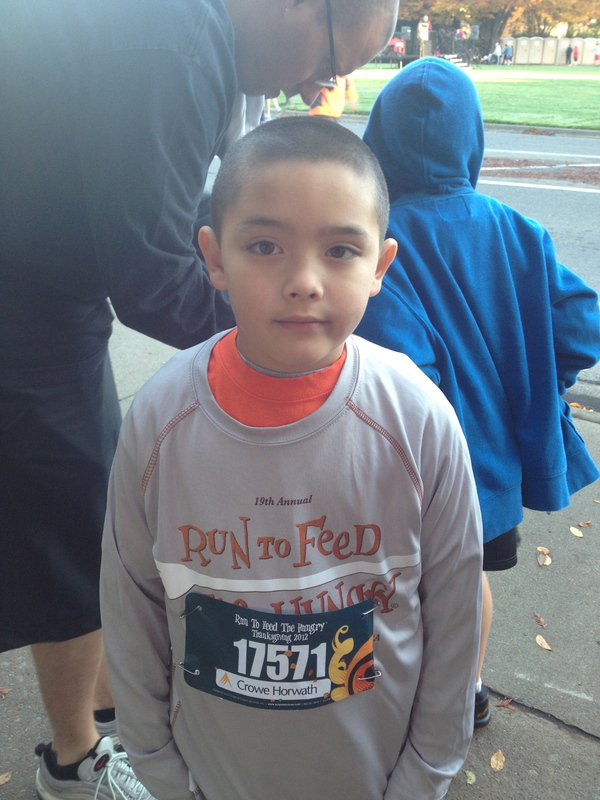 Ben and I both did the Run to Feed the Hungry Race in Sacramento, our home town :-) It was for a good cause and a great way to stay on track with our fitness goals. It was a little hectic training for the race. Balancing training and preparing for the holiday was a bit tough. Gio’s schedule changed to half days the whole week before Thanksgiving. This meant that I had a 5 minute window between picking his brother up and picking him up from school. And that I had Both boys at home. Ben and I had to trade off doing our runs and workouts. Despite the craziness, we both managed to get our training in. And I was able to cook for pretty much an entire day for the holiday. I was kind of dreading this race. I kept hoping that the forecast for rain would change, but it didn’t. This is a big race for Sacramento. There was 27,000 people doing the race. My goal was to beat my last time of 25:30 and I was really worried that I wouldn’t be able to because of all the people. 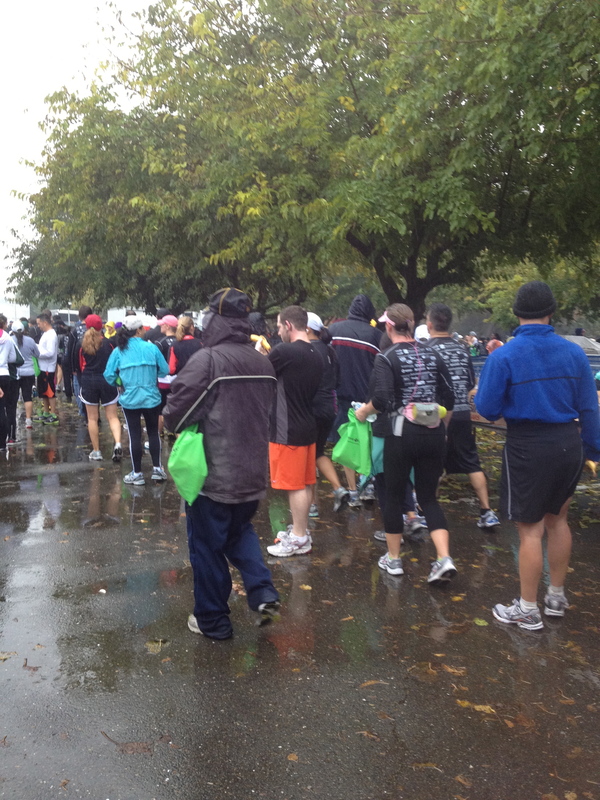 My First 5k was small in comparison (only about 1000 participants). We were up at 6a. Ben’s dad decided that he would bring the boys and cheer us on. Of course, the one time they decide to sleep in is the one day they can’t. Lol. They were not happy to get up with us. But the idea of playing in the rain cheered them up. There is just something about the rain and puddles that kids love :-) We were worried about parking so we headed out early. We got there about an hour before the race started. 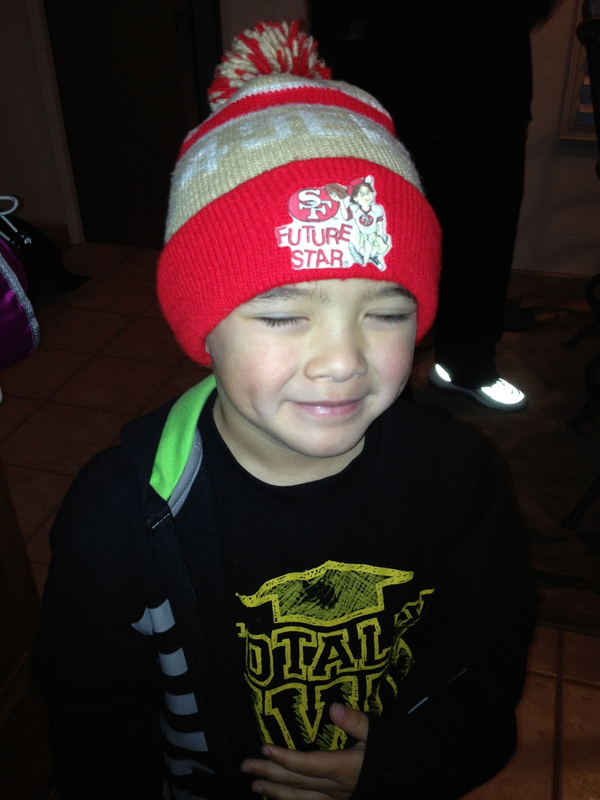 Sleepy Seppe ready to go. It was crazy! There were so many people! I’ve never seen that many people in one place. We parked about a couple blocks away from the finish line. We had to walk around to find out where to pick up our bibs and shirts. And it rained the whole time. 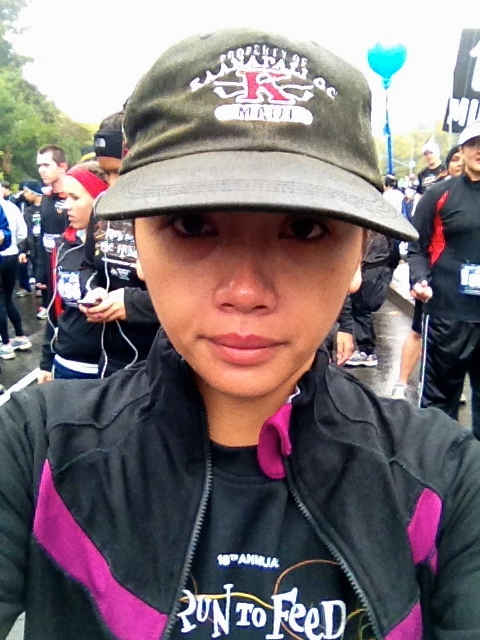 I was freezing cold and wet before the race even started. I was suppose to meet up with my friends and brother but there was just so many people there that we couldn’t really find anyone. 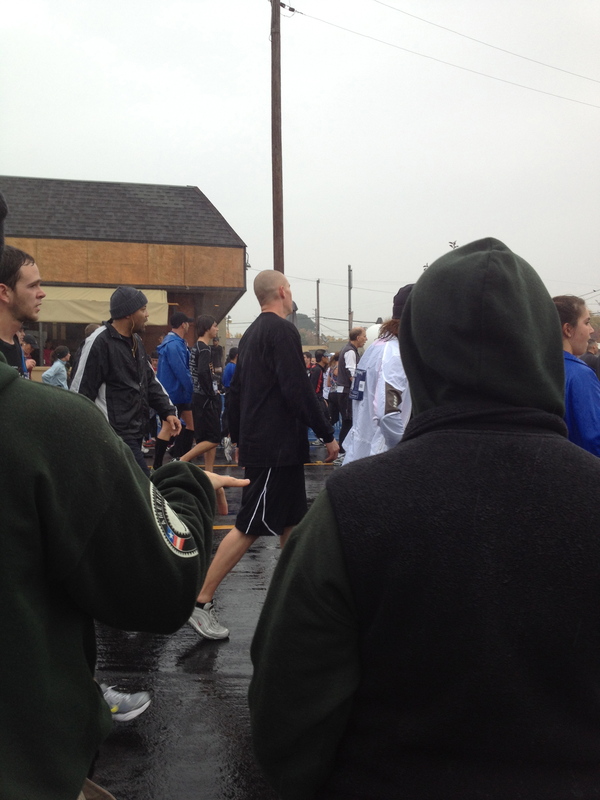 We headed towards the finish line to find a spot out of the rain that the boys and Ben’s dad could wait at. Java City was open and we were one of the first people there so we grabbed a table and waited for the race to start. I had a Luna bar and Zico for breakfast and was glad that the coffee shop had clean bathrooms to use :-) I really didn’t want to use the porter potties by the start line :-/ I was getting a little anxious. 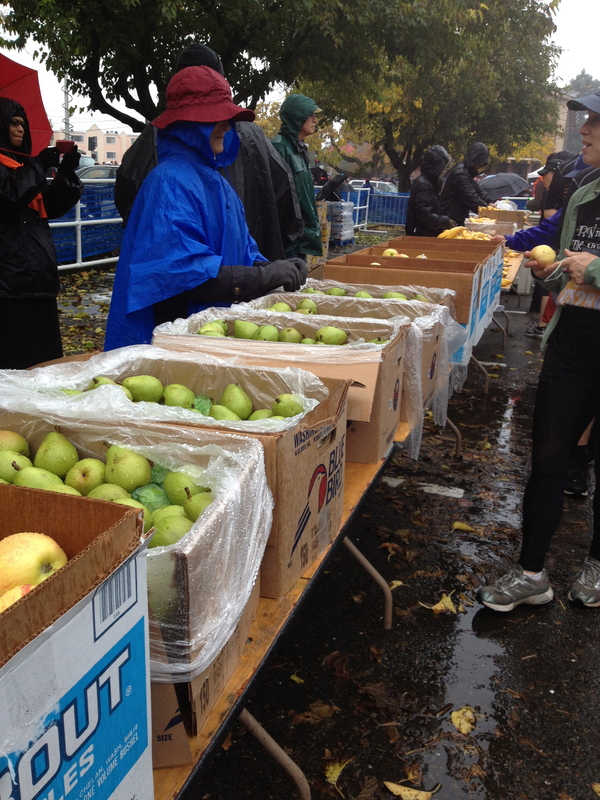 It was a big race and it was raining. I was really worried about slipping and falling. I was worried about not reaching my goal. I’m not a super serious race person but I trained hard and I really wanted all my hard work to pay off. 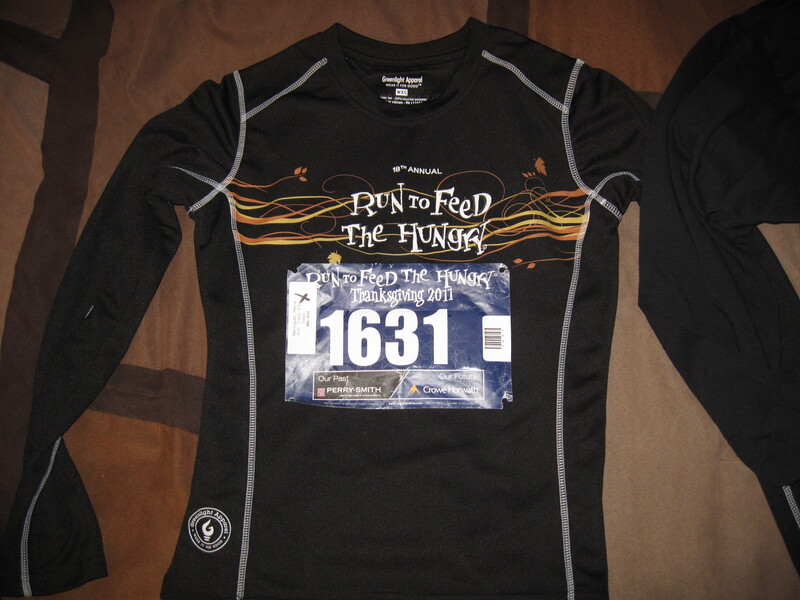 There were two types of bibs handed out – one for those that were being timed and one for those not being timed. I had to pay extra to be timed. They had separate starting places for timed and non-timed racers. I headed up to the front and put myself at the 8min/mile pace marker. It was obvious that people didn’t care about the pace markers because you could tell that there were people who were not being timed in the timed areas. I separated from Ben but he could have easily joined me. I think a lot of people were up front just to be on camera since the local tv station was there broadcasting the race. 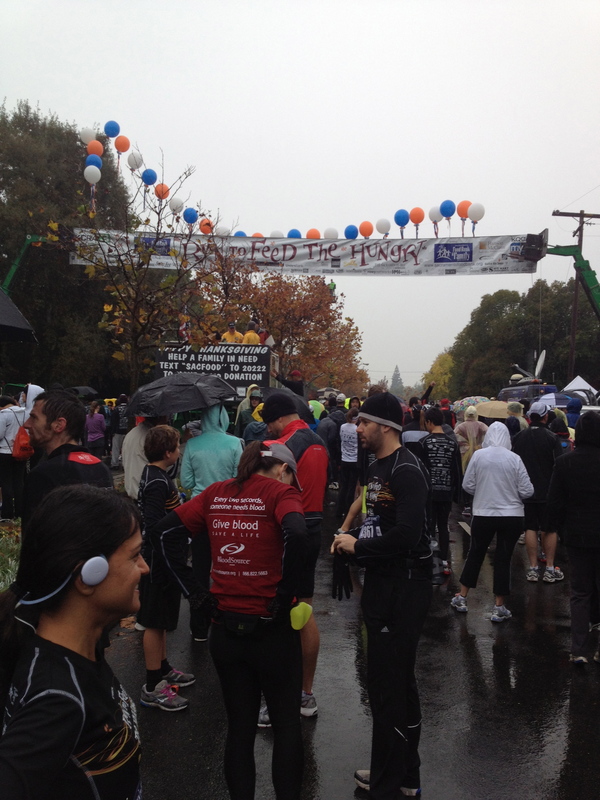 Making our way to the start line – View from where Ben started. Getting a little closer to the start line. I always get a rush when the count down starts. I told myself that I just had to do my best and see what happened. It wasn’t raining as hard but still raining when the race started. 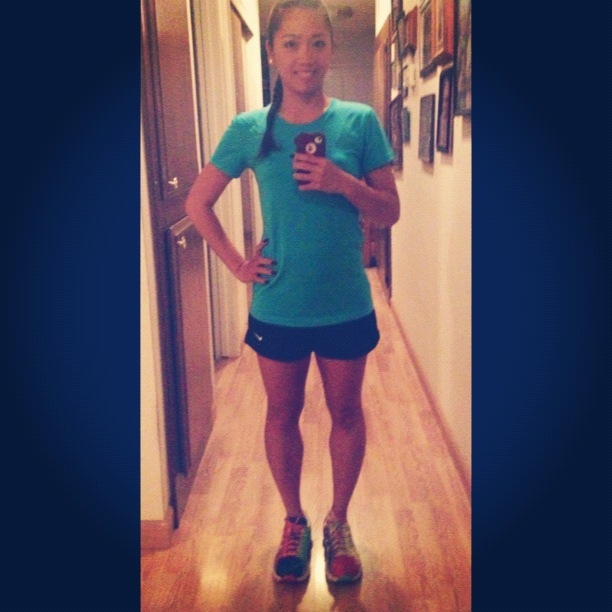 I was able to start off at a jogging pace and got around a large part of the pack. I was hoping to catch up to my brother (who is a very good runner) but it felt like there was never an end to group of people in front of me. The route was really nice and simple. No hills. 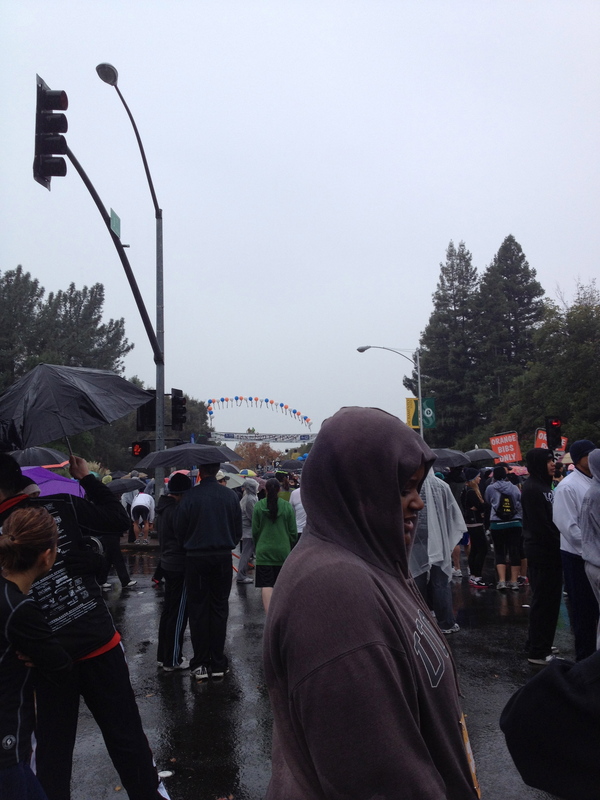 People were lined up along the streets and cheered the runners on. I really liked that there were mile markers posted. At 2 miles I sped up a bit. 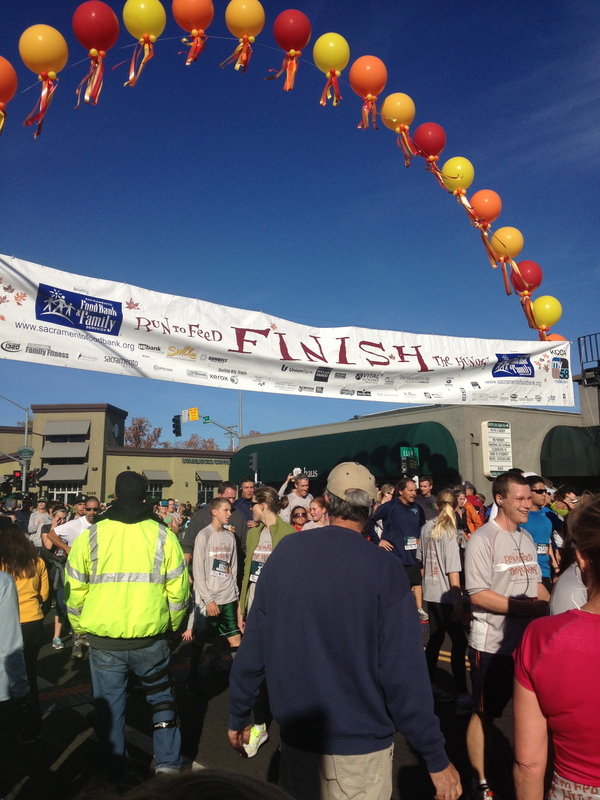 As soon as I could see the balloons for the finish line, I sped up some more. There was a teenager running next to me at the end and I made it a point to beat her. lol. 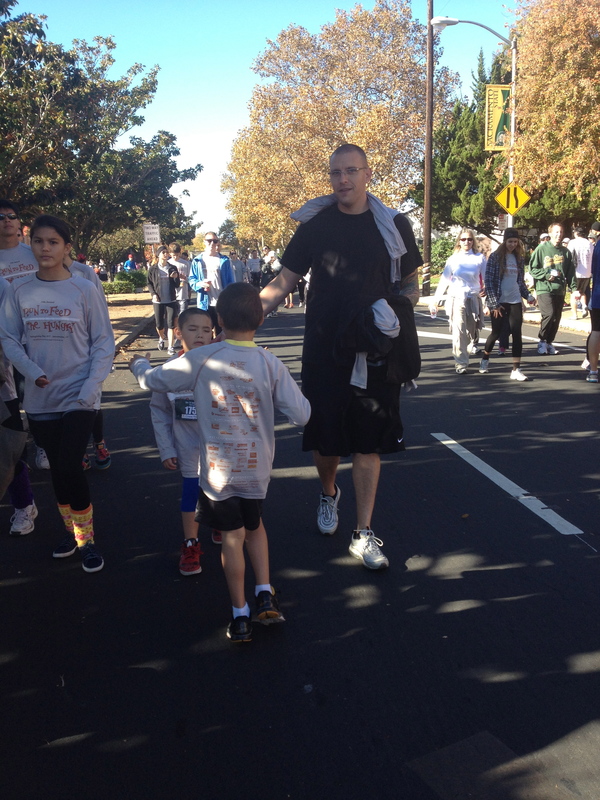 I did see my brother at the end of the race. He finished about 5 minutes ahead of me. One day I’ll catch up :-) Ben finished about 5 minutes after me. He wasn’t timed but he did go faster this time around. Finding Ben at the finish line. 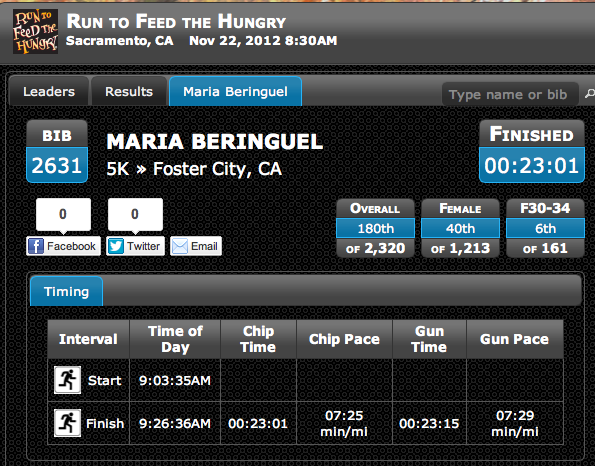 So not too bad for my second race :-) I beat my last time and set a new personal best. I am very happy. I’m thinking of finding a 10K to train for in the next couple months. I’ve really come to enjoy races. 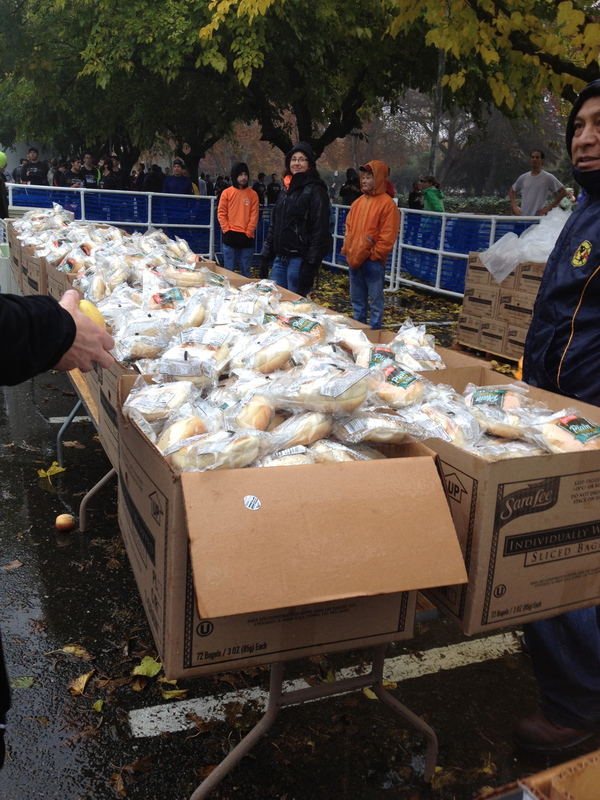 They also had bagels, granola bars, and peanut butter cookies. Line of people waiting to get their goodies. Bag we used to carry the food and water.